Watch as van Persie falls into cameraman pit during Manchester United’s 2-0 win over QPR on Saturday at Loftus Road. The title-hopefuls gave a professional performance, securing victory thanks to a stunning first-half goal from Rafael and a late strike from Giggs who marked his 999th senior appearance for the club. In the animated clip and video you can see van Persie get down to the byline and stretch to get his cross in. In his efforts to do so, the striker is knocked off balance and ends up falling into a cameraman pit, with a cameraman. 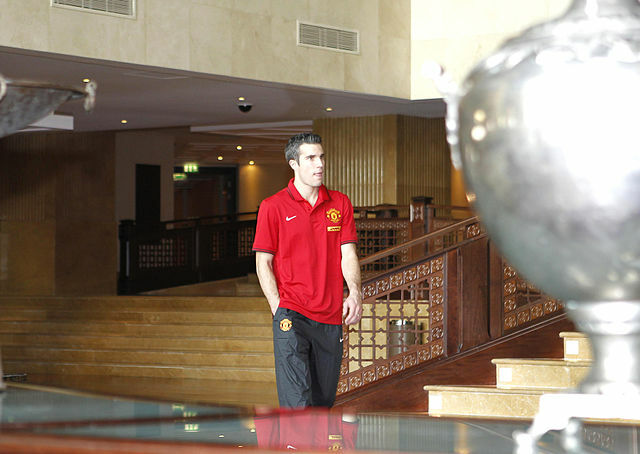 Robin van Persie continued for 18 minutes after his fall, but was then substituted and apparently has “severe bruising”. He collided with a camera, which was in a dug-out piece of ground. He hit the base of it and has a very bruised hip. I imagine it will be tender and sore for a few days but hopefully he will be all right, especially for the Madrid game [on Tuesday 5 March].